PTSD was first recognized as a disabling service-connected condition and given a VASRD code in 1980, 5 years after the Vietnam War ended. As a result, as many as 80,000 veterans, many of them Vietnam vets, had undiagnosed PTSD that caused conduct that kept them from receiving an honorable discharge. These veterans can now submit petitions to the Military Boards for Correction of Military/Naval Records to have their discharges upgraded, which MAY make it possible for these veterans to receive medical benefits. any other evidence that shows that PTSD or a PTSD-related disorder existed at the time of service and may have contributed to the misconduct that led to the other than honorable discharge. Basically, this means that, even though a veteran wasn’t officially diagnosed with PTSD or a related disorder at the time of his discharge, if one or more symptoms of what we now know as PTSD or a PTSD-related disorder were documented in either his medical record or his service record, that condition will be considered as having existed at the time of his discharge. 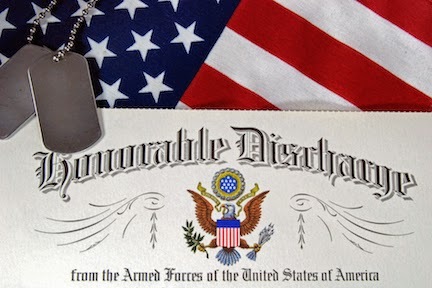 When reviewing the circumstances surrounding the non-honorable discharge, the Boards will then be required to take into consideration how the PTSD could have contributed to the situation. If the Boards feel that there is enough evidence to determine that PTSD played a significant role in the circumstances, they can then upgrade the status of the discharge to a more appropriate level. Each branch of the military has its own Board for Correction of Military Records. We list each on our site with full instructions on how to apply. See our discussion of the DoD's Level 2 of Appeals. On the application form, make sure to state that you are applying for a discharge upgrade based on undiagnosed PTSD.